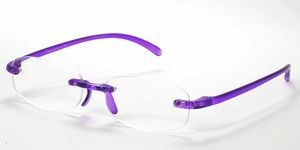 In an attempt to perhaps save money and / or the time to go to the eye doctor for a thorough eye exam, many folks often purchase their first pair of reading eyewear at a drug store or department store from one of those ubiquitous counter carrousels holding eye. Over-the-counter eye are basically a simple single-strength magnifying lenses in a generic glasses frame. What makes over-the-counter reading glasses so convenient is you do not need a prescription, which is fine if both your eyes don’t have radically different vision levels. 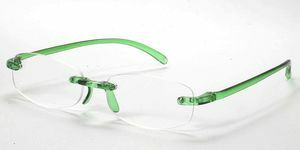 Glasses frames at this point may not be an important consideration, however, you will find a limited choice of over-the-counter reading frames, unlike the wide range of frame options you have at Eyeglasses.com. In order to choose the correct strength reading glasses, you need to know your reading power. Some folks just try on various over-the-counter reading eyewear till they find a pair that seems to do the job. However, there are sites online where you down load and print out a pdf of a Diopter chart to help you determine what reading eyeglasses strength to buy. These types of eyewear may work in the short run. But major downside to this type of generic eyewear is it assumes both eyes need the same magnifying strength and there are no other vision issues or optical defects like astigmatism. Unfortunately, wearing such mismatched ready-made reading eyeglasses can result in nausea, headaches and other symptoms of eyestrain. It is time to go to the optometrist or ophthalmologist and get a thorough eye exam. A pair of reading eyeglasses purchased with a prescription ensures that the wearer has the correct prescription for both eyes accounting for additional optical corrections. Once you know the “power” of the reading glasses lenses or have an actual prescription plus your Pupillary Distance (PD), you can easily order reading glasses at Eyeglasses.com where you can choose a frame that best suits your face and preferences. Usage and your own preference usually determines whether you need full frame or half frame reading eyewear. Eyeglasses.com offers both types. Some suggest that full-framed reading glasses should be worn by people who spend most of their day looking at objects or written material within about 12”-16” from their eyes. This type of reading glasses allows the wearer to clearly see close up items. If the person looks at something in the distance, however, it will appear blurry. Progressive lenses alleviate this issue. Ask your eye doctor if progressive lenses would be better for your reading glasses. The second basic reading glass silhouette is the half frame, sometimes referred to as “Ben Franklin” frames. These reading glasses sit lower on the nose than regular glasses, allowing the wearer to look over the top of the half frames to see objects in the distance. 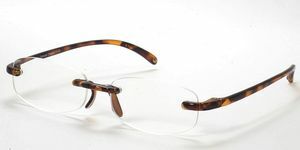 Two stylish examples of inverted half rim reading glasses are the Sophia Loren M173 and the Flexon 624, while Revue reading glasses are available in both half and full rims. To see our selection of half eye eyeglasses, go to our advanced search page, and select Style: Half Eye. EyeGlasses.com carries other designs of reading eyewear including smaller, foldable glasses, monocles, and pince nez. 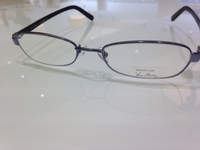 Chakra Eyewear offers a number of reading glasses styles including monocle and pince nez reading glasses. Foldable reading glasses allow a person to attach the glasses to a chain and wear it around his / her neck for easy access. Folding reading glasses fold up into a smaller package, making them more convenient to carry around. Although monocles were most prevalent in the late 19th century, and are less frequently worn today never the less, the monocle can have a corrective lens to enhance the vision in only one eye. Today some folks may feel that a monocle is more as distinctive fashion statement or affectation rather than a utilitarian reading glass, but at Eyeglasses.com we do carry several versions of monocles. Another more unusual style of eyewear without the side earpieces and temple to support the frame and lenses is the pince-nez. Pince-nez are anchored onto the bridge of the nose via several different methods. They can be used as reading glasses or for distance depending upon the prescription of the lenses. Today you are more likely to see a character in a television series such as Poirot in Agatha Christie's Poirot), in the movies; "Meet John Doe," the classic Capra movie, the character of D.B. Norton wears an interesting pince nez, or the character Professor Tofty, a wizard working as an Examiner for the Wizarding Examinations Authority in Harry Potter and the Order of the Phoenix features a pince nez, or in novels rather than someone in real life. Do you know the US president who wore a pince-nez? Answer: President Roosevelt Eyeglasses.com offers foldable glasses, monocles, but also pince nez reading glasses. At Eyeglasses.com designer, and folding reading glasses are the most popular types. Eyeglasses.com reading eyewear is available in metal, titanium, and plastic frames. 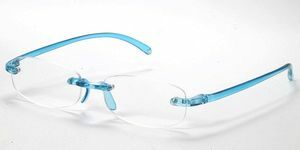 Some of the reading eyeglass frames will accommodate progressive or bifocal lenses, but you need to read the description of the specific eyewear product. You can also check with us by calling 1-888-896-3885 M-F 9am-5pm EST.